Hello Katie Girl: Taco Time! I'm trying this summer to not only shop my closet, but also to shop my pantry/refrigerator. After spending quite some time organizing the pantry and my spices this summer, I realized that it's all too easy, especially when only cooking for two most of the time, to let food go to waste. I've resolved to try to make recipes based on what's available, as opposed to running out to the grocery store and getting specifics items and then letting them go to waste. Today I realized I had everything for chicken tacos: a few left over chicken breasts, lettuce, tomato, corn tortillas, and a can of green chilies. The only thing missing was the chicken taco seasoning, but have no fear, the solution to that issue proved to be just a click away thanks to the miracle of the Internet. The recipe below happens to be a mishmash of things I discovered online from researching various recipes and combined together to make my dish. So here's how I made it these chicken tacos, just in case you happen to have these ingredients lying around too! If you don't have these spices, use what you have. 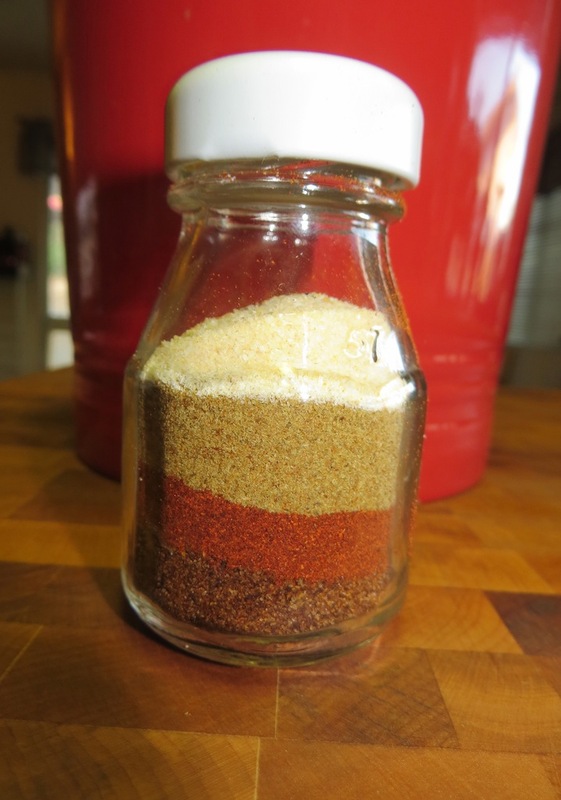 You can also use some cayenne pepper too in place of the paprika. When you all of the spices together into a jar of your choice it will end up looking like some sand art project (see picture below), so make sure you mix it all up good. Next, dice your chicken into bite-sized pieces. I suppose you can also cook a whole breast and then shred it, but I found that this way worked best. Here I am using about 1 1/2 pounds of chicken breast, which was left over from dinner last night. You can use more or less depending on the size of your party. I mostly cook for two, so this worked out to be the perfect amount for six medium tacos. When the chicken is fully cooked, add the seasoning and about 1/3 cup of water. Bring the sauce to a boil and then cook on low for about five minutes. The amount of seasoning you use with the chicken will depend on the amount of chicken you are cooking. I used about 1/4 of the seasoning to cook this amount of meat. It all really depends on the level of spice you like. Make sure you taste as you go; a good cook always tastes and checks the level of seasoning! For a little more heat I added some mild diced green chilies. Add these after you have seasoned the chicken with the spices. The green chilies will add just a touch more heat to the chicken for a more complex flavor. I happened to have these lying around, which is why I threw them in. Shop that pantry! I didn't show the last step, which is to scoop the chicken mixture into a corn tortilla and then fry the tortilla in some canola oil. The reason I didn't show this was because it was a mess and I partially burned my finger in this last step with the hot oil! (Hopefully this doesn't stop you from trying the recipe!) Anyway, here's how this process is done if you are brave enough: Heat canola oil until sizzling hot over medium high heat. 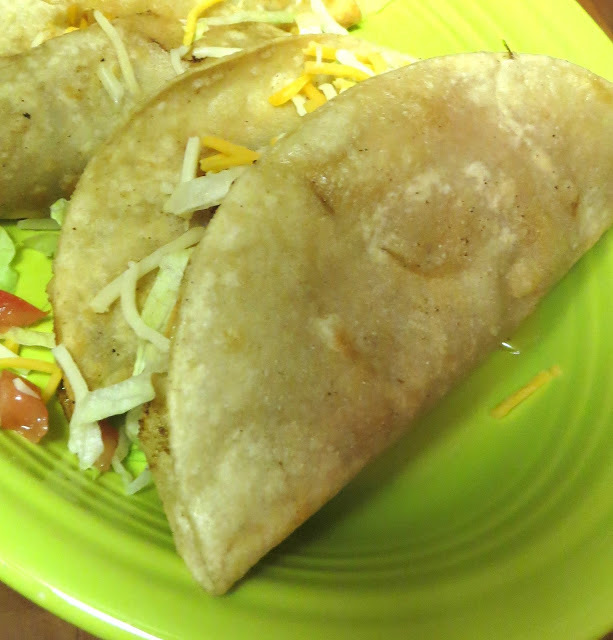 Take a corn tortilla filled with chicken mixture and fold in half. Use metal tongs to lay the folded taco into the oil until it holds it shape. Let it fry for about 30-45 seconds and then flip with the tongs. When the taco is fried, place on a paper towel to absorb the grease. 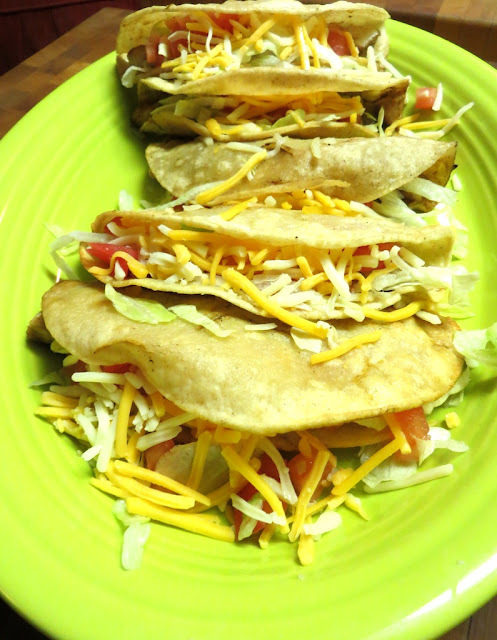 When your tacos are done frying, carefully add your toppings, which can include lettuce, tomato, cheese (please!) and sour cream. If you want to be healthier you can also use soft flour tortillas and skip both the health and burn danger of frying the tacos. As a side I made a corn salad. All you do is heat up about 30 oz. of frozen corn (or you can half the recipe if it is for two). Add in two to three chopped scallions (green onions) and 2 tbs. of olive oil and 3 tbs. of white wine vinegar. Add salt and pepper to taste. Bring salad to room temperature or put into the fridge for up to one day. This makes an excellent and refreshing side to your tacos! Yes, they were quite tasty! Frying tacos up tastes so much better, but the ones from the store are less of a hazard! I love any food with a Mexican slant - that looks great!